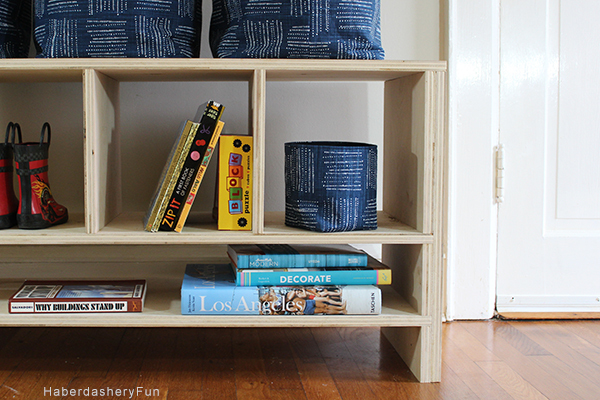 I am addicted to making storage bins. How about you? 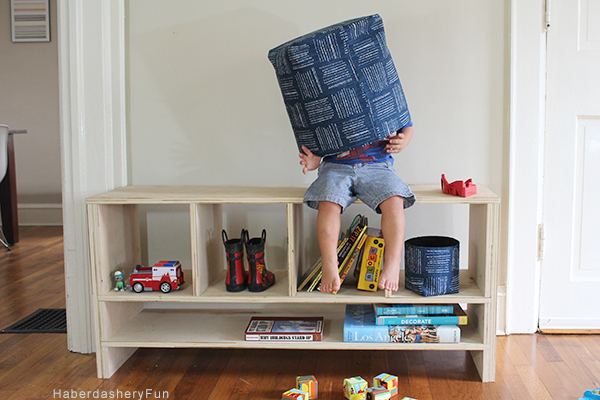 My friend Carla asked me to make extra large fabric bins to store her son’s toys. The caveat – she wanted the fabric to be fun and modern, as she planned on leaving the bins around the house. We found the fabric on Premier Prints. I love their entire denim collection. The fabric I used is called ” Brave Italian Denim Slub Canvas”. They have an entire range of fabric that has the look of denim, but is actually canvas. 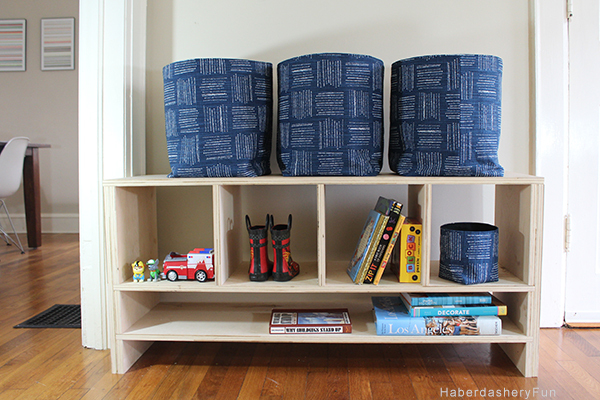 Fun fact – I made 3 extra large bins and 1 mini bin from 2 yards of fabric. And there was enough fabric left over to make a pouch or 2! 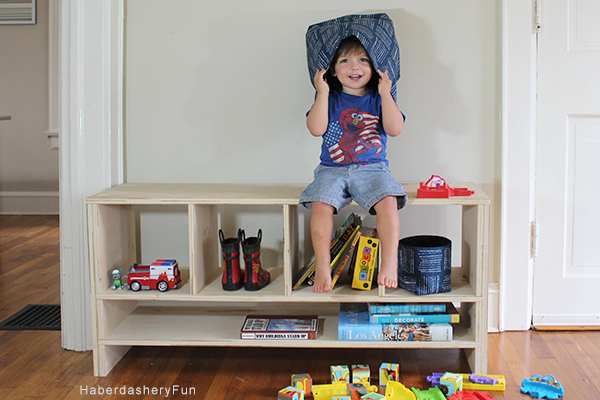 Fabric – 2 yards is enough for 3 extra large bins and 1 small bin. Note that you need to also buy lining and interfacing. Interfacing – Fuse the interfacing to the wrong side of all fabrics. Sewing the bottom / Boxed Corners – The boxed corners will be slightly different than the original tutorial. For the Extra Large Bin measure inwards from the point 5″ and for the mini bin measure inwards from the point 2.5″. Be careful with prints, especially directional patterns. This will not work with prints that lay all in one direction. The print will be correct on one side and upside down on the back. Tutorial Steps – Refer to the full tutorial HERE and HERE for step-by-step instructions and pictures. Choosing this denim slub canvas fabric to make the bins was a success!! 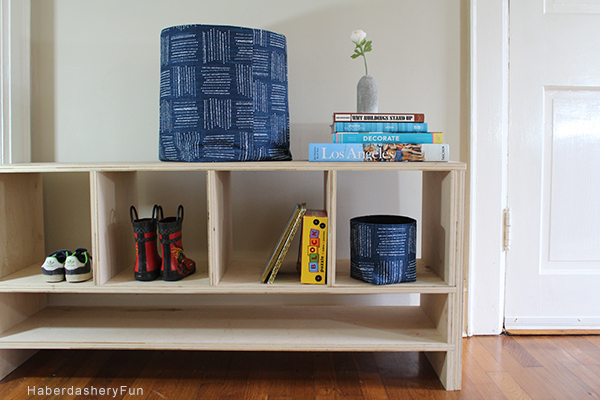 The bins are modern, yet with a beachy feel and ideal for storing things around the house. My friend Carla lives in Santa Monica, California, so we nailed it! 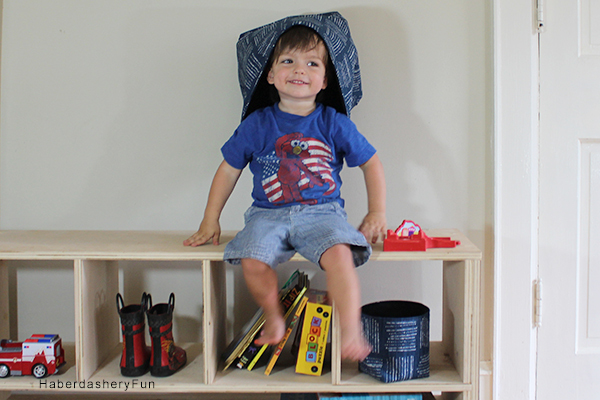 And.. don’t you agree that full fabric bins are perfect for dumping and turning into hats!? Do you know what weight this fabric is? I’ve checked the website but didn’t find that info. I am looking for fabric to make a tote bag to carry as a “personal item” when flying – so it may be a little stuffed at times and WILL HAVE TO ENDURE being crammed into small spaces at times. I think it would be great for a bag and I have thought about making one myself. If you use interfacing it will be very durable. Description: Screen printed on cotton slub canvas (slub cloth has a linen appearance); this versatile medium/heavyweight weight fabric is perfect for window accents (draperies, valances, curtains and swags), accent pillows, duvet covers, upholstery and other home decor accents. 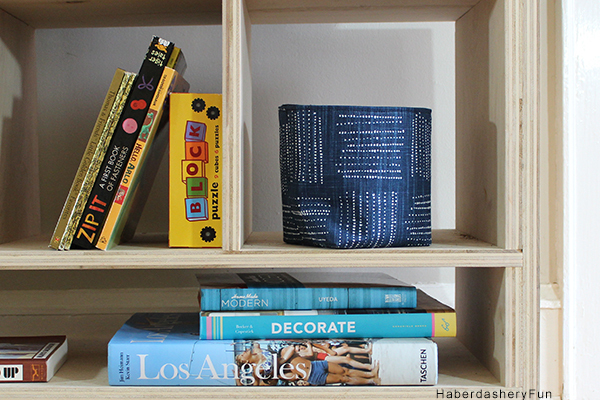 Create handbags, tote bags, aprons and more. Washing Instructions: *Use cold water and mild detergent (Woolite). Drying is NOT recommended – Air Dry Only – Do not Dry Clean.